Did you forget the Lamborghini addon? 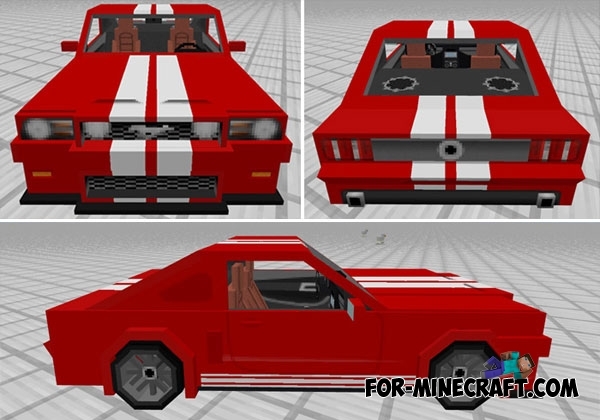 It's time to change your car on red Ford Mustang with a white stripe down the middle. This is a fast car that will move you from home to any location in a few minutes. It is very hot muscle car that is suitable for fast driving, especially with friends. Besides being able to steer, you also get the trunk to store 27 items. 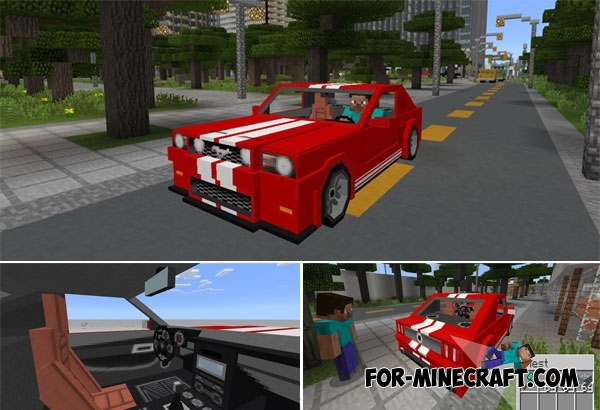 Alas, but addons for Minecraft PE always replace any object or creature, so do not be surprised if you find this car in the marshes. The fact that the Mustang replaces a witch, to spawn it you need a witch spawn egg, as well as the car key to control. Both items can be easily taken from the creative inventory or using third-party mods. The main feature as you can see is the appearance. You agree that the car is very beautiful and memorable both inside and outside. You will only need to sit inside and feel the charm of Mustang. The second feature is the trunk that can accommodate about thirty any items. To open the trunk (car inventory) approach it close or open the inventory from inside. Eventually who does not like to drive fast? Just call friends who need to install this or any other car addon that have been added to our website.